Cup on the Bus: How long is a thread! There are Lamborghini's and Austin Martin's and Ferrari's of looms, too. 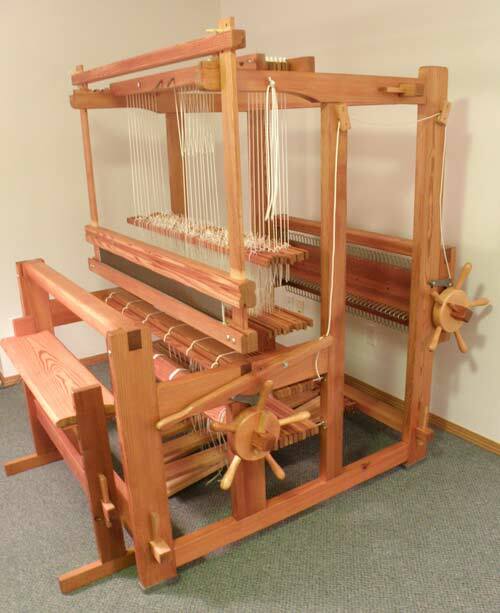 The farthest into the subject I can venture with confidence is Glimakra, the imperial Swede of looms. Given the reputation of Sweden for perfection, a Glimakra is the union of a Volvo and a Lamborghini, overseen by Saab. Some interesting looms came our way when my sister and I were weavers. You remember the cherry Kyra and Saffron Two Cats. Once we were approached to purchase the dies and patterns of the Newcomb Loom Company. We passed the offer along to a friend in manufacturing who specialized in reviving old companies. As it always seemed to happen, someone a couple of counties away approached us to buy a twenty year old, new, in the box, Glimakra. Eight harness, ten or twelve treadle, never used, Glimakra. A fellow bought it for his wife, and assembled it. She divorced him; he put it back in the box and it resided in the back room until he wanted to sell the house. This was about 1990. Our studio was thirty by forty and at the time, and had maybe half a dozen looms. We bought the Glimakra for what he paid, seven hundred dollars. All the tie up cords were rotted; all the string heddles had disintegrated. I called the only Glimakra dealer I could find, Maurice Brassard in Quebec, and ordered Texsolve replacements. Of course I told him about the Glimakra loom we had scored. Maurice asked the name of the person we bought it from, and groaned. “That is the first loom I sold in this country!” And not even for old time’s sake would he give me a discount on the very expensive replacement pieces I needed. I looked long to find a single picture of a Glimakra like we had. It is the only picture I found with the bench attached. Our loom was about ten by ten, the size of a small room, and a countermarche loom. It has a double set of lams to lift each harness. I only mastered the tie-up by reciting “bottoms up” for each lam. A Glimakra is like the grand piano of a studio. A mighty imposing sight, in the space of say two or three smaller, more useful looms. My best analogy is it requires twenty three gears to advance six inches. Jan and I wove one item apiece on it, put it back in the boxes and sold it. We each had a favorite brand and style of loom. 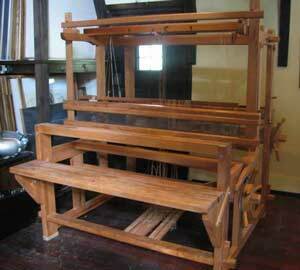 Hers was Schacht Loom, manufactured in the west; mine, LeClerc, from Quebec. When I bought new looms these last couple of times, it was LeClerc each time. Over the years the LeClerc founders have retired and Maurice Brassard owns LeClerc. This last time I returned to weaving I found myself replacing everything, down to the thread I’d weave with. When I left off, three years ago, I was depressed at the state of the weaving thread industry in this country. There no longer are mills in America, and no cottons spun for sweaters. I researched the internet looking for cottons with good hand, for towels. Good hand simply means how the thread, or the fabric feels to the hand. Eventually I settled on cotton marketed for weaving towels. How wrong could I go? I didn’t care for the way it felt weaving, but I persevered, knowing the thread had not passed through the final process, fulling. As we said in the olden days, “It all comes out in the wash!”, which is fulling. Like everything, there really is no magic. In the case of those first four towels I wove, magic was necessary. They had no “hand”. In fact, they felt like sandpaper; little saw blades. I was so upset. I reached out to every old weaver I knew. What to do?!? One friend in Virginia said she knew Brassard, in Canada, was spinning, but knew nothing of the thread. I called the distributor from whom I’d bought the little saw blades on a cone and explained that although they advertised it as suitable for towels, it was closer to haircloth. She suggested I might want their 8/2B cotton. In fact, the colored cones I’d purchased were B, and it was quite soft. I felt a cone, and yes, very soft. Good hand. It took some prying to learn that their 8/2B is spun by----wait for it----Brassard in Canada. As soon as I have a run of towels off the loom and fulled, I think I’ll send Maurice a towel and a note. We did a lot of business over the years. I think he’ll be amused, but I doubt he’ll give me a discount! This is a contemporary Glimakra countermarch. The bench is no longer attached. I cannot see that anything else is changed, except this is smaller than ours, which was sixty inch weaving width, and about eighty inches wide overall. I know absolutely nothing about weaving and l find it fascinating how intricate the knowledge of something like this can be. And to think there is an almost infinite number of other skills out there. I am still out of my depth, and still fascinated. And cannot say too often (or loudly enough) how much I love my towels. Butter soft and wonderful. Interesting. Maybe you should charge him for the towel... no discount. Sounds like this loom is like the Lamborghini - not that useful. I've never seen a Lamborghini in the snow - probably never will. I'm glad to hear that Quebecois/Canadian looms and thread are top quality! And of course he's not going to give you a discount, LOL -- his prices are in Canadian dollars and the American dollar is worth about $1.30 in our money. You're already getting a good deal because of the exchange rate! An interesting history with the loom Joanne. I'm super impressed with all your knowledge of different looms and threads and now I really want to see one in action. I'll have to visit my neighbour V and ask her to let me know when she will be starting her small loom again. She gets yarn from the local alpaca farmers and makes mats and cushions for her chairs and for her cats to sit or sleep on. Looms and weaving are obviously very popular in the States Joanne - nobody over here has anything like that superloom. You are certainly an expert with loads of experience. Good old Canadian thread. Trump should be nicer to us. Simply wonderful stuff. Thank you. Very impressive. A beautiful machine, too. One would call that a machine, right? Yes--machines aid work. Actually, looms are computers, and Jacquard looms used punch cards. Those were invented mid 19th century. Such a fascinating story. Thanks for educating me on weaving! so much distance and so much lost between then and now. glad someone is still making good thread. So am I, or I'd be getting rid of another loom! Well, at least it had a semi-happy ending although you needed to order thread twice! Did they take the first stuff back?